The new 115,000 sq. ft. Walter C. Johnson Center for Health and Wellness houses Hackley’s physical education and athletics programs, as well as the school’s growing wellness programs, including mindfulness and meditation practices, nutrition education, and yoga. 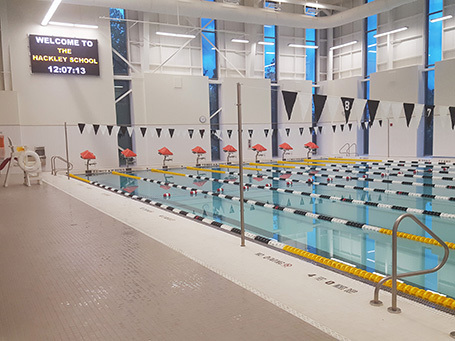 The state-of-the-art complex includes a competition pool, cardio fitness center, three basketball courts, eight squash courts, a fencing studio, a wrestling room, a free weights room, a modified indoor track, three classrooms, a wellness studio, a teaching kitchen, a concession stand, locker rooms, office space and common areas. 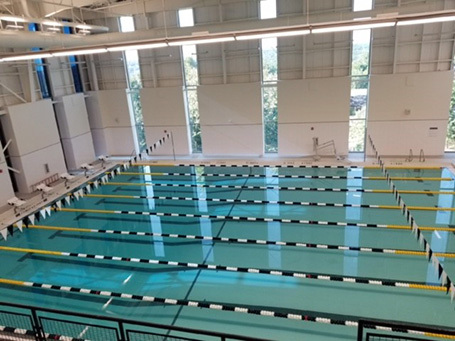 The natatorium includes an eight lane, 25-yard competition pool, video-matrix scoreboard, and electrochromic glass windows on the three exterior walls allowing for automated tinting depending on the time of day. This results in an abundance of natural light while minimizing the amount of water surface glare. 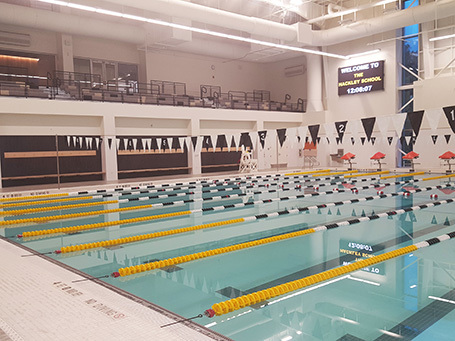 As the project completed, Counsilman-Hunsaker conducted a Certified Pool and Spa Operator Course through the National Swimming Pool Foundation specifically for their staff. The Hackley School invited other operators from around the area into the class. Both the traditional CPO course and specialized situations were covered for their specific facility. This training gave the organization’s maintenance staff both the credentials needed to open their facility and the knowledge needed to keep their facility well maintained and safe for their users.